On second floor approached by 2 sets of steps. Split level with open plan lounge / dining / kitchen area with 6 steps down to 2 bedrooms and bathrooms. Twin bedded room has ensuite WC , shower and basin. Separate shower room with, basin and WC. Fitted kitchen with induction hob, electric oven, fridge / freezer and washing machine. Large flat screen Smart TV with wide range of British and European channels, DVD player. Free wi-fi connection. Large verandah with table and chairs. Sun beds available. 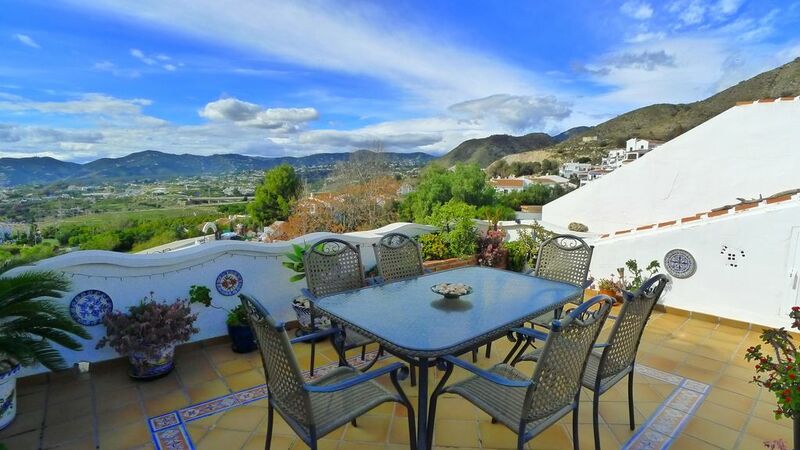 Superb views of mountains one way and the town of Nerja and sea views the other. We have lived in Rickmansworth, Hertfordshire for past 25 years and are now semi retired. We have been visiting Nerja for the last 25 years, staying in hotels for the first 10 years, then discovered this lovely apartment. We fell in love with it straight away, as it is on a well established urbanisation with lots of little walkways and sweet smelling flowers. We love the verandah with its views of the mountains one way and the town and sea views the other. It is only about 5 - 7 mins drive into centre of town and the beaches, but it is peaceful and relaxing to stay there. It is split level giving a feeling of plenty of space. The communal swimming pool is large and spacious and there is separate children's pool. There is a selection of restaurants and poolside bars to enjoy, so you don't even have to leave the urbanisation if you just want to relax. There is also an on site supermarket. There is plenty of parking opposite the apartment, and it only takes a short time to drive into the town or beach, or there is a regular bus service if you don't want to drive. toilet, shower, Ensuite WC. Shower cubicle and wash basin in vanity unit. Dual air conditioning / heating units in all rooms. towels cannot be taken out of the apartment so bring your own beach towels. Lounge / Dining / Kitchen area. Sofa bed, 2 armchairs, coffee table, dresser, TV. Round glass topped table with 4 chairs. Spare chairs in bedrooms. Lamps. There is usually salt, pepper, dried herbs, rice, pasta, sugar, washing up liquid etc. Dinner and tea plates, mugs, cups and saucers, wine glasses, tumblers, saucepans, oven pans, scissors, cutlery, bottle opener, corkscrew, potato peeler, garlick press - most items anyone would need. Table and 4 chairs in dining / kitchen area. Cable channels provided through Community link on urbanisation. Most European channels including all BBC / ITV and some Sky. CDs can be played through DVD player, and memory sticks or i-players can be used through the stereo - please bring your own connecting 3.5 mm stereo jack and cable. Backgammon, Scrabble, playing cards and other games in drawers. Communal Gardens well tended with beautiful flowers. Plants on verandah, would appreciate if our guests can water during their stay! Large roof terrace leading from lounge, with table and 6 chairs. Sun canopy. Sun beds available -stored in wardrobes. Ideal area for eating and barbeques. Great views of mountains. Lovely sunsets. Not suitable for people in wheelchairs or those who have difficulty with steps, including elderly people. However, most people will climb the steps with no difficulty at all. Large communal swimming pool and separate childrens pool area. Cafe overlooking pool for breakfast, snacks and drinks. Sun beds available for hire. This was our Sixth time back to San Juan. Had a great holiday apartment was great home from home. Great terrace and views. Secure and cool. Even without the air con the apartment stayed cool at night. Would recommend 10/10. We stayed as two adults and two kids aged 10 and 12. The apartment is the second one we have stayed in on this estate. It was fabulous. Had everything needed. The location is near to the pool with fabulous views from the lovely terrace. The apartment was clean and spacious with a real homely feel to it. Being on a split level added character and having two bathrooms was brilliant for family needs. The beds were comfortable and clean and the air con was great in all rooms. We only used it in the evening whilst we were in as there were lovely breezes from the coast. The plants on the terrace and the fairy lights made the place feel special and very much reflected the homely feel we look for. All together a great time was had in the area and the apartment was a 10/10 and we would definitely return. So glad you enjoyed your holiday in Nerja and that you were happy with the apartment. We love going there whenever we can which is why it feels so homely - unlike a hotel room. Everyone loves the verandah, and it is great to sit out in the evening and watch the sun go down. Lovely spacious villa with superb balcony! We have just returned from a week in this lovely well maintained apartment. Wonderful views from the balcony and all day sun! The apartment was well equipped and has the benefit of air conditioning and WiFi. The owner was very helpful and everything was very straightforward. We will definitely be back. So glad you enjoyed your stay. So many people love the balcony and the view. We look forward to receiving your next reservation. The large terrace, which is not overlooked and has sunshine all day long. There are great sea and mountain views and as it accessed from the kitchen, it's so much easier to cook in than a roof terrace. Large, comfortable bedrooms, with aircon in both. Beds are comfy. Right opposite the bus stop, plus plenty of parking outside. Well equipped, with everything you need to self cater. Great pool area not too far from the house, but far enough to be quiet. It's €3 for a lounger plus €1 for a parasol. However, plenty of grassed areas to camp out on. Small, but well stocked shop on the site, plus a few bars and restaurants, if you don't want to go to town. You can walk to town, about half hour to the centre. Taxi back ranges but around €7. The apartment is up a number of steps, which was the only small downside. However, you would not get the view otherwise and this also meant it was lovely and quiet. We'd definitely rent this apartment again when we return to Nerja. Glad you enjoyed your stay in our apartment, and that you particularly enjoyed the verandah with its lovely views. waren für uns (2 Erwachsene, 2 Teenager) perfekt. Am besten haben uns die schöne Terrasse mit dem traumhaften Blick auf die Berge und das Meer sowie der zu der Wohnanlage gehörende Pool gefallen. Die Ausstattung der Wohnung war gut. Das Einzige, was nicht so optimal war, waren der Zustand des Wasserkochers (völlig verkalkt) sowie die abgenutzten Töpfe und Pfannen. Da man in Nerja sehr gut und günstig essen gehen kann, hat uns dies allerdings nicht weiter gestört. Insgesamt lässt sich sagen, dass das Preis-Leistungs-Verhältnis bei dieser Wohnung stimmt und diese auf jeden Fall zu empfehlen ist. We are so glad you enjoyed your stay in our apartment and that you were happy with the facilities. Sorry to hear about the kettle being calcified - that is the problem with hard water. We will replace it next time we stay there. We are surprised to hear that the saucepans are worn as they were fine when we last there about 4 months ago. It looks as though we will have to replace some of them as well. We like to keep the equipment in good order to maintain good standards. Thank you for your feedback, and we are pleased you were happy with everything else in the apartment and with the area generally.